Neither of our training sites include accommodation. We can, however, provide you with assistance in finding local acommodation close to our training facilities. Please call Diane on 07708 - 993907 for more information. The 2 week theory and practical module takes place at the Enka College in Swindon & London. At the conclusion of the course there is a time-based assessment of the students ability to accurately complete a site setting out process. 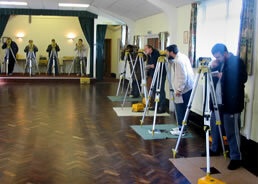 Students are tested on the practical application of setting out theory and correct use of instruments. The assessment is based on a real life scenario, with students working from drawings and marking out positions. The accuracy of the marking is assessed to make sure that each one precisely locates the parts of a building illustrated in the plan. We strongly recommend that prospective candidates should consider all the information before they book a course. Information is provided on the types of candidate who should apply.